You are here: Home / Blog Post / Where to get auction donations and goody bag ideas? Try HARO. UPDATE: The call mentioned has passed. Stay abreast of future free trainings by subscribing to Benefit Auction Ideas. I’m soon offering a call (on September 27, 2012) on auction procurement for live auctions, silent auctions, raffles, and goody bags. As a prelude to that call, here’s a more unusual acquisitions tool most people don’t even know exists. It stands for Help A Reporter Out. It started out as a simple, free listserve reporters would use to let subscribers know about the stories they were writing. Experts in the subject could contact Joe, who might use them as a source. In time, the list grew. Then in 2010 it was bought by PR software company Vocus. (Vocus also owns PRWeb.) There was concern the list would no longer be free, but the basic service is. Somewhere along the line, HARO also became a bit more wide-reaching. For instance, there’s an entire section devoted to gift bag item requests. You can post requests for auction donations and goody bag items on HARO. Every Friday I receive a long list of nonprofits and for-profit companies planning events. They each seek donations for goody bags and (on occasion) auction items and raffle prizes. 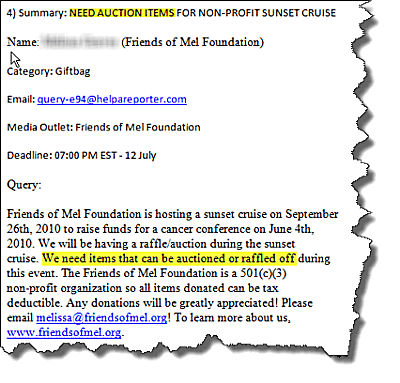 The attached graphic shows the more rare example of asking for auction donations. It was posted in the category of gift bags. All types of groups post. Event planners seeking eco-friendly gifts for an environmental conference … or cosmetics for a conference of women CEOs … or tech gadgets for a music awards show. Is this the BEST way to procure items for your auction? But it is one method you likely haven’t considered.